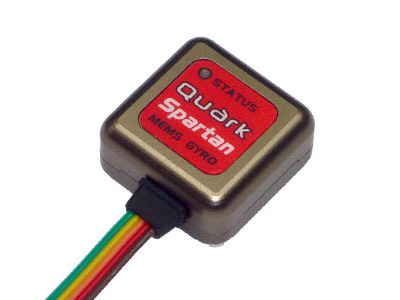 Whether you are an ambitious beginner, a 3D Pro or simply love gadgets the Spartan Quark is the ultimate gyro choice for you. Its easy setup, high vibration immunity, and unparalleled performance are guaranteed to give a hassle free installation and enjoyment of your hobby. Do you love heart pounding 3D? We do; and we designed the Quark to deliver just that! The Quark is a high specification model helicopter gyro capable of delivering exceptionally consistent yaw rates even at eye-blurring speeds of over two full turns per second. The control is smooth and precise with a very solid feel and impressive holding power. The stopping characteristics give a nice soft, but precise response with no bounce back. The built in configuration routine allows adjustment of individual left and right endpoints, direction reversing and servo type selection. In addition the Quark can be connected to a computer offering access to more advanced parameters including yaw acceleration, deceleration, stop gain and many more. 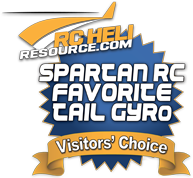 Backed up with Spartan RC's industry-leading warranty and including 3 years free repair service and 50% RRP discounted crash replacements the Quark offers market leading performance, exceptional value and reassurance.